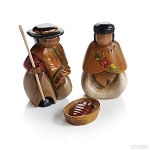 This charming nativity set “las manos” was designed by artisan Felipe Enriquez. He was born in 1970 in Quinua, a small village near the city Ayacucho. Ayacucho is located in an arid area of the Andean highlands of Peru that was the birthplace of the Shining Path guerilla movement. The region’s residents were often caught in the middle between the guerilla forces and the national army. The violence continued for many years, and made it increasingly difficult to survive. In 1994, Felipe decided to improve his life situation by moving to Lurin, an impoverished area on Lima’s outskirts. He found work in the small workshop of his brother, Julio, making ceramic artisan products. Felipe had already gained experience in working with ceramics by learning from his uncle. While this area has traditionally been dependent on agricultural activities for personal sustenance, the arid climate has made it difficult to obtain sufficient income from working in the fields. For that reason, many of the villagers have developed small businesses making ceramic artisan products from the local clay. After several years of working together, Julio suggested that Felipe start to develop his own designs in his spare time. 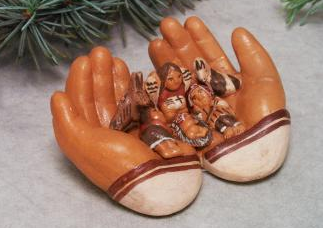 The nativity scene in two hands was one of the designs developed during this time period. The product proved to be a success, and has provided enough income for Felipe to start his own small workshop. He now operates independently, and hires another three to six artisans to complete orders.